If mom is a sucker for carrot cake than these carrot cake almond pancakes are the perfect breakfast for her. Not only are the quick and easy to prepare on a Sunday morning but, they are also a low calorie food. Only 120 calories per serving! For this recipe, skip the syrup and go fo the cream cheese yogurt drizzle instead. Step 2: Meanwhile, in a bowl, using an electric hand mixer, beat together yogurt, cream cheese and almond milk until smooth and runny. 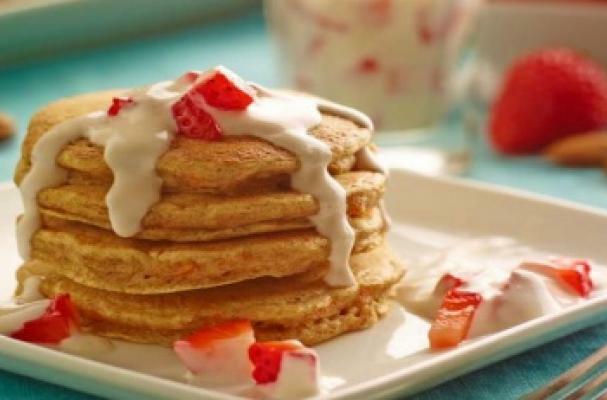 Stir in strawberries Spoon drizzle over pancakes and top with berries. *Note: Substitute whole wheat flour with almond flour for a gluten-free version of this recipe.